Wipro Campus Greater Noida is a Gold rated LEED certified Green Building by IGBC (Indian Green Building Council, under the umbrella of USGBC) in New Construction Category. This project has been designed to provide an interactive campus environment in a tranquil setting. The activity hub with common facilities like recreation, cafeteria and sports centre is planned along the central axis with software office blocks on either side of the axis. The reception, library & rejuvenation areas are curvilinear in stark contrast to the efficient, straight and rectangular forms of the office blocks. 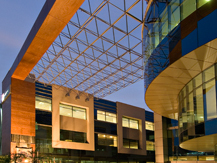 Knowledge Boulevard is a GOLD rated LEED certified Green Building by IGBC (Indian Green Building Council, under the umbrella of USGBC).The project incorporates a highly energy efficient design with the goal of obtaining a high performance, low maintenance, low operating cost facility achieved through sustainable and energy efficient design features. Location is another keyword that can be best used to describe Knowledge Boulevard that faces the National Highway 24 in sector 62, NOIDA. This iconic building has great visibility from the National Highway. This large complex is an iconic building with great visibility from the Highway. The metro station is less than 5 min walking distance from this complex. It has all the active and passive features of a classic Green Building like Double Insulated Glass, Vertical Fins, Insulated roofs to name a few. 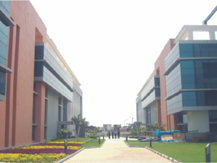 Patni Campus, Block B - Noida is a Gold Rated LEED certified Green Building. This project is a quantum leap in comparison to the conventional procedures, which accomplish lesser criterion. This project sets up stringent standards for its contemporaries to follow and provides them with a direction to further improve on those standards. A strong monitoring process is installed to lower the energy consumption on the development every subsequent year. Several Passive and active functionalities have been optimally designed to minimize energy consumption. 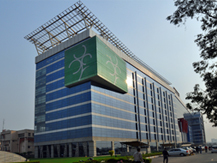 Spectral Services, Hyderabad is a Gold Rated LEED certified project. 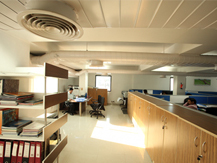 The office is located at Jubliee Hills in the heart of Hyderabad city, which is well connected with adjacent areas by public transportation and has an excellent access to basic amenities. The workspace design exhibits an attractive, collaborative and naturally daylight area. Majority of the workstations are positioned on the periphery of the floor plate; open plan layout with minimum interior walls allowing ample light and views helping in reducing energy bills. The design maximizes natural daylight and fresh air, uses less energy, cuts running cost and improves work environment. The project demonstrates exemplary performance in construction waste management and use of regional materials. Rapidly renewable materials like Bamboo with recycled content that are not harmful to occupant’s health are used to give the project a touch of nature.